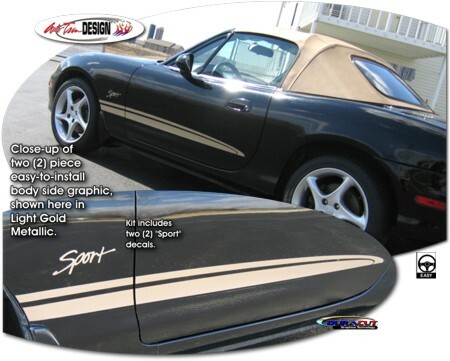 Set your '99-'05 Mazda MX-5 Miata apart from the rest with this unique Body Side Graphic Kit. This easy-to-install kit is packaged as a set of two (2) pieces - one (1) for each side. They're PRECUT and ready to install in a wide variety of colors. Slight trimming is required at door jambs. While graphic kit is designed to fit '99-'05 Mazda MX-5 Miata's, with a little trimming it may fit other vehicle applications. Graphic is designed to be placed approximately 0.25" (6.35mm) above the painted gravel guard commonly found on the MX-5 Miata.